Throughout history, Contenders have been known to handle rough seas and get you to the fishing hotspot before it's competitors. 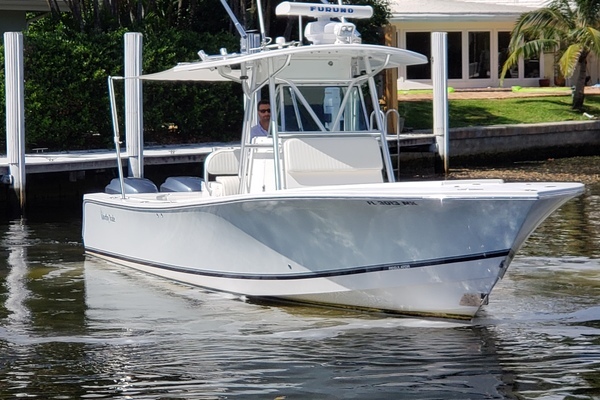 This particular model goes a step further by combining the "open" space of a center console with the comfort of a walk-around, giving you the ultimate hybrid fishing machine! This contender 31 has been re-powered with 2013 Yamaha F300 Four-Strokes and with only a hundred hours they are barely broken in! The Contender 31 is a legendary hull that has been battle-tested time and time again by the most fierce anglers and always delivered effortlessly. If you are looking for a boat that gives you confidence no matter what the task at hand is, look no further.This boat has been meticulously maintained and has been stored OUT OF THE WATER! Which means no thick bottom paint that damages performance and the overall look of the vessel. No corrosion on the trim/tilt assembly on the motors, which in turn means no need to worry about leaks coming from the trim/tilt assembly. This boat also comes with a full cover and has been stored under a cover its entire life so no need to worry about chalkygelcoat,or sun damaged paint, electronics, & upholstery. No need to worry about dirty bilges since this bout was hauled out after use, there was virtually no raw water left in the bilge during storage.This vessel has been outfitted with new electronics such as but not limited to:• Garmin Touchscreen GPS’s with Radar• Garmin VHF with MOB interface for GPS• Raymarine Autopilot• Clarion Marine sound system• Yamaha electronic throttle controls• Yamaha Command Link gauges• Spotlight• Dual 30-Gallon Live-wells• Dual 56 Gallon Fish-boxes• Lewmar Windlass• Underwater LED Lights• Three-axle aluminum trailerYou do not want to miss out on a vessel like this, Call and schedule a showing today! United Yacht Sales New Jersey would love to guide you through a personal showing of this 31' Contender Center Console 2003. This yacht for sale is located in Miami, Florida and priced at $125,000. For a showing please contact us by filling out the form on this page and we will get back to you shortly!